What is Remoistenable Glue? Traditionally, it is the glue that you lick (or remoisten) on an envelope flap. The vast majority of Remoistenable Glue applications are done by envelope manufacturers and by printers for multi-coloured pieces that are printed on a full web press. The type of glue used in these applications is a cold glue Remoistenable Glue that is applied in a pattern. Since these types of self-mailers are hard to photograph, I’m showing some illustrations. What do you do when that happens? Call us! The mailers can be printed sheet fed and then we use a nozzle to apply the hot-melt Remoistenable Glue and inline fold or slit to the finished piece. 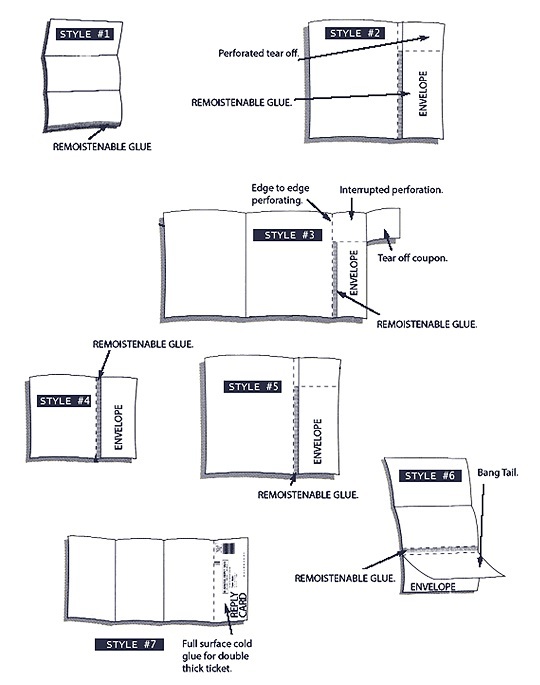 We can also form a glued pocket with two lines of cold glue (see diagram #6), as well as apply a “U” shape lines of glue and make inline micro stop-perforations (see diagram #3). Remoistenable Glue from a web press looks different than the glue we use. The hot melt glue we use is shinier and easier to see. Our minimum stock weight is 60lb offset and our maximum stock weight is 7pt.